To honor excellent scientific work in the area of Biomaterials and Regenerative Medicine, the SSB+RM will present one Research Award a year, for either an outstanding PhD thesis or an outstanding MD/DDS thesis. The awards will be given based on originality and impact of the work. The research award consists of CHF 1000.- and a certificate. To qualify for the Research Award, the candidate must have completed and defended her/his PhD/MD/DDS thesis during the last 12 months at a Swiss university or be a Swiss citizen who defended in a foreign country. The topic of the research must be related to the scope of the society. The author of the thesis may nominate him- or herself. The candidate must have at least one accepted paper as first author in a peer-reviewed journal. Send your application to the SSB+RM secretary. The Award Committee is composed of active members of the Executive Committee of the SSB+RM who will evaluate the applications. Their decision is final. The winners are expected to present their work at the SSB+RM Annual Conference. 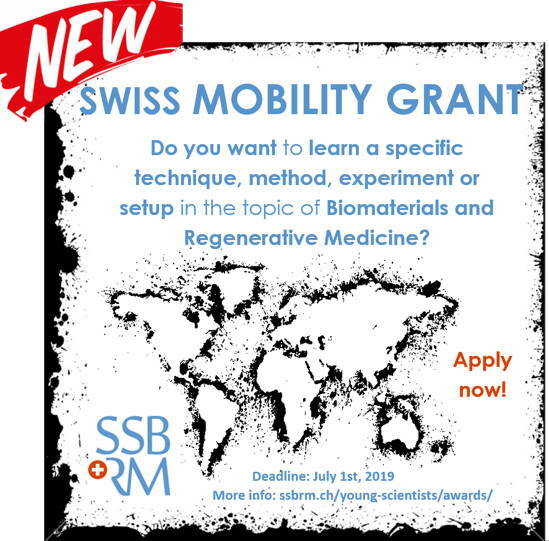 The SSB+RM Student Mobility Grant intends to support students from Swiss research institutions to visit other centers of research to learn specific techniques, methods, experiments, setups, etc. The award will be given based on originality and perceived value to be gained for the applicant’s work. The mobility grant consists of CHF 1500.- and a certificate. The applicant has to be a registered (Undergraduate, Master, PhD or MD) student at a Swiss institution. Send your application to the SSB+RM student’s representative. Awards will be announced within one month after the deadline. The awards will be paid at the latest by August 1st and January 1st, respectively. Student awards were originally established in the SSB+RM meetings in order to give young scientists recognition of their scientific performance, which could be documented in their curriculum vitae, and to encourage them to continue their research career in the field of biomaterials.  During the SSB+RM Annual Meeting, a best student poster and best oral presentation award are presented, each for the amount of CHF 500.–. For the oral presentation, we strongly advise students to read our guidelines before starting to prepare the presentation. To qualify for the student award the candidate must be under 30 years of age, a registered student at a University (Letter from Dept. head required) at undergraduate or postgraduate level. Not included are applicants carrying a Dr. degree and studying for a second Dr. title or applicants studying for an MBA after completion of a first degree. The student must be first-listed and presenting author. For posters they must be present at the official poster presentation time. The submission must clearly be the work of the applicant and not that of any co-author. the ability to interact with the audience during the discussion period including the presenter’s knowledge of the research field and involvement in the entire project. Awards may be won for poster or oral presentation.